Shoelaces are something we rarely think about yet they have a big impact on every day life. They're quick and easy to weave. It's fun to make for kids in their favorite colors, or even their school colors. How cool it would be if their team uniforms included custom shoelaces? Here's the ins and outs of everything you need to know about shoelaces. Wonderful resource for tips on making the aglets (the ends of the laces). 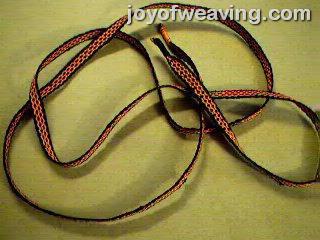 Weaving them is simply a matter of inkle weaving (narrow warp faced bands). The shoelace page will help you with making the aglets and how long to make them, etc. Embroidery floss is a good thread to use. Here's a Halloween colored shoelace I made with embroidery floss.